Set up a kid's paddling pool with a plank of wood propped up on some bricks running across. Fill with water and add a few cheap plastic sharks (below left), then have the kids take off their shoes and socks and walk the plank! If they find it too easy make them try it with an eye patch on, blindfolder completely or with one hand tied behind their backs. 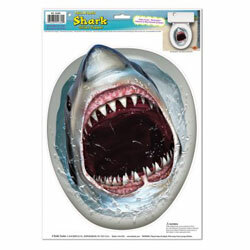 If you want to make these pirate party games more scary, stick this cheap shark sticker (below right) to the bottom of the pool before you add the water. 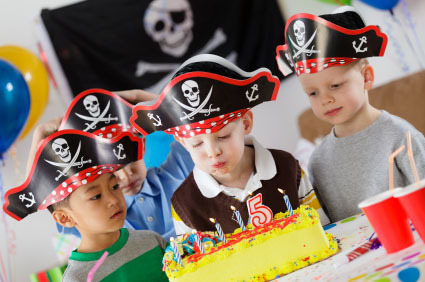 Treasure hunts always go down well at a kid's birthday party and they're quite easy to tailor to become one of your pirate party games. 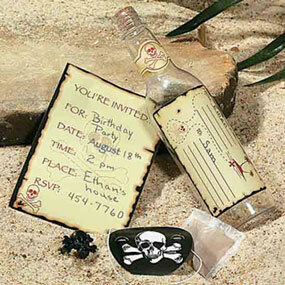 Bury a small treasure chest full of prizes somewhere in the garden a few days before the party and mark the location with an X. 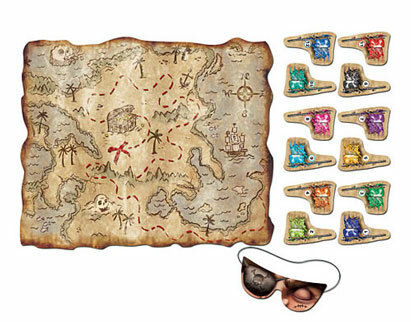 Then use these clue cards (below right) that the kids must follow to find the location of the burried treasure. 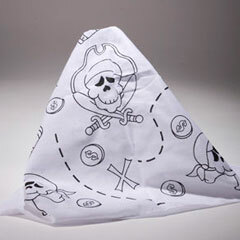 You could also use a different prop as a landmark to help them find each clue (ex, the clue card could tell them to find a parrot in a tree, or look for a skeleton hand pointing in a particular direction towards the next clue - see here for cheap pirate props). For younger children you could take photos of each prop beforehand and give them the photos of each clue to help them find them. As they discover each clue they can be rewarded with some chocolate gold coins to keep them going until they find the buried treasure. 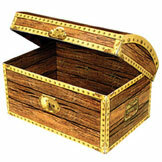 When they've found the X that marks the spot, have an adult dig up the treasure chest and pass out the prizes inside. 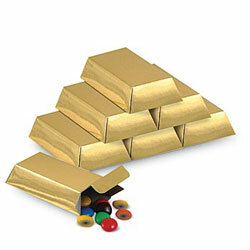 For an alternative treasure hunt, hide lots of these gold bar favor boxes around the house / garden. 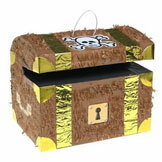 Some can have prizes or candy inside while others can have booby prizes aka 'Fools Gold' or forfeits. See here for cheap prizes and favors. Fill up a paddling pool with water and put in lots of gold coins, beads and jewels, but place a toy shark on top of each one. Hand out fishing nets and give each kid twenty seconds to fish out as much treasure as they can without scooping up any sharks. If they scoop up a shark they have to forfeit their treasure. See here for supplies. 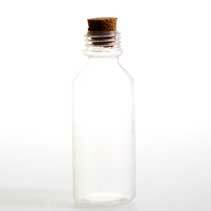 Similarly, have them fish for messages in bottles bobbing in a paddling pool while blindfolded—inside each bottle is either details of a prize or a forfeit / dare. Alternatively, you could write a number on the scroll inside the bottle and they have to collect enough bottles to score a certain amount before they can collect a prize. See here for bottles and nets. 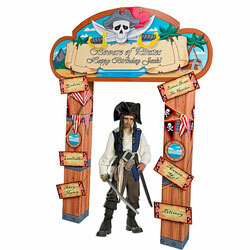 This prop is great value and a nice way to theme any photos taken during the pirate party games. You could send a photo of each child out with your thank you notes. Pick up a pack of these shark fin visor kits (below left) then get one volunteer to start off as the shark. 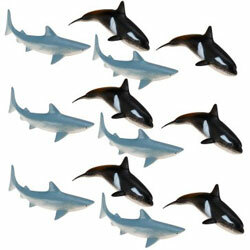 The remaining pirates have to run from point A to point B—past the shark in the middle. 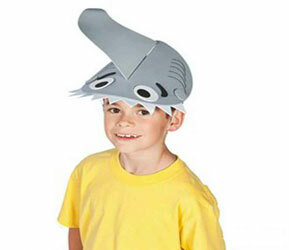 Every time someone gets caught by the shark, they also become a shark and put on a shark fin hat until there is only one pirate left standing who is the winner. 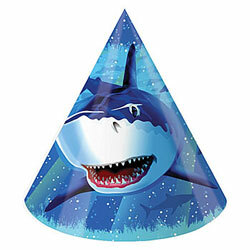 For a budget option, use these shark party hats (below right). 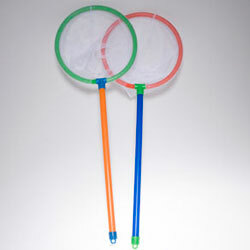 See here for these supplies. A variation of Simon Says, but replacing Simon with Long John Silver (from Treasure Island) or you could use Captain Jack if they're a fan of Pirates of the Caribbean. A variation of musical chairs with the chairs replaced with treasure maps. 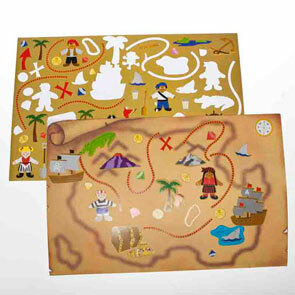 Use these treasure map placemats and lay them on the ground so there is one less than the number of players. 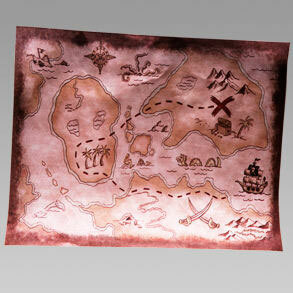 Have the pirates circle the treasure maps while the music plays, then when it stops they have to dash to stand on a map. Every time someone looses they can be made to walk the plank (see above). 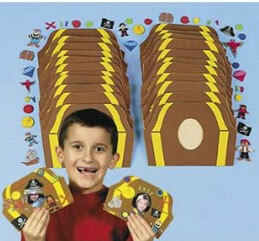 There are so many ways to turn this classic blindfold game into one of your pirate party games. 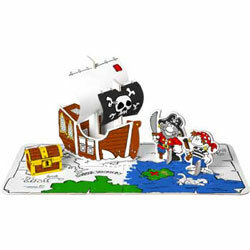 You could print off a picture of a pirate and play Pin the Eye Patch on the Pirate, use a picture of a pirate ship and play Pin the Jolly Roger on the Ship, or for $2 I'd recommend this treasure map version to pin the flag on the lcoation of the burried treasure. 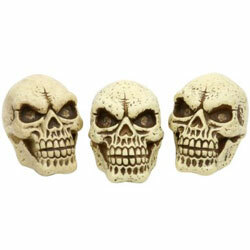 Pick up some inflatable skulls and add an eye patch or pirate hat to each, then line them up on a wall. 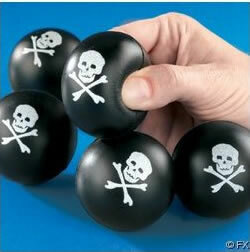 Give the kid's some cannonballs (small black bouncy balls) and see if they can knock the skulls of the wall. You could also split them into two different teams and have them race against each other to see who can hit all their targets first. 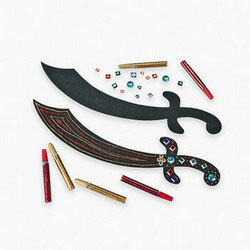 See here for these supplies. 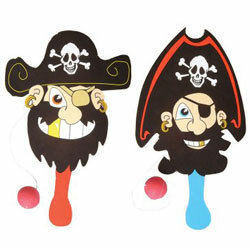 There are a few ready-made pirate themed games available such as this bean bag toss game or these pirate paddle balls. 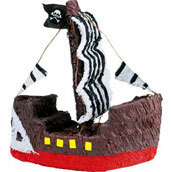 There are load of great pirate themed pinatas around so let the kids have a good whack at one as part of the pirate party games. 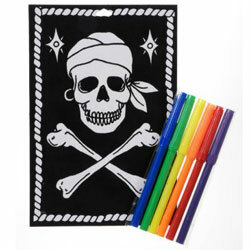 Pirate themed coloring activities are a really cheap and easy way to keep kids occupied while waiting for everyone to arrive. 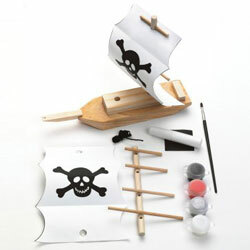 Similarly, there are lots of nice craft kits that you could work into the pirate party games such as this 'Create Your Own Pirate Ship' activity or this pirate sword craft kit. 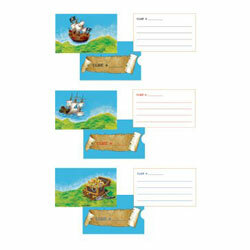 Or this jumbo 'Create Your Own Treasure Map' sticker set. As I mentioned at the top of this page, you'll be amazed how long kids can be kept entertained by just playing at sword fighting. 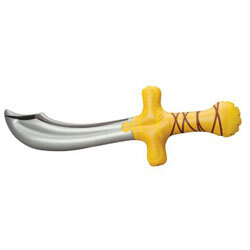 So hand out these inflatable swords and let them get on with it! 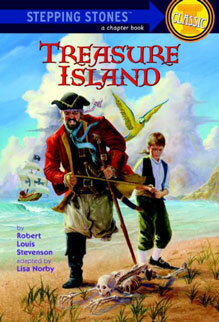 Calm the kids down after all the pirate party games by reading to them from an illustrated copy of Robert Louis Stevenson's classic pirate story Treasure Island . (UK visitors see here) . 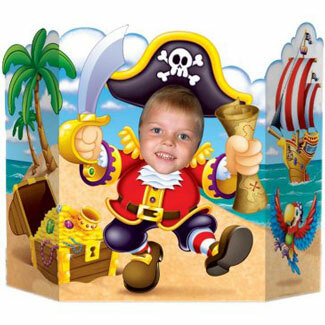 If you're looking for some more party ideas to compliment these pirate party games, check out my Pirate Party Ideas page with inspiration and ideas for pirate themed party invitations, pirate themed kid's birthday party food and drink, and pirate party decoration ideas. 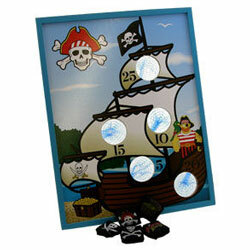 Did you find these pirate party games helpful for your birthday party? If you did, please share this page with friends by hitting the Facebook or Twitter buttons at the button of the page. I'd really appreciate all the help in promoting this page. Alternatively, you can use the "Enjoy this page?" link below to cut and paste the link address for this page of pirate party games onto your own website, blog or any relevant forum that you contribute to. 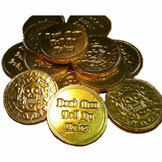 If you have your own ideas for Pirate Party Games share them with other party-ideas-by-a-pro.com visitors. If you have any photos of the game being played, perhaps at your own Pirate party, please upload one or two of these too. 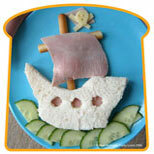 Use the form below to submit your Pirate party games or activities.